Are you a Yoga practitioner or teacher / trainee teacher who wants to deepen your practice and understanding of Yoga? Do you wish to refresh your approach to Yoga and to evolve on this wonderful path? Do you want to learn traditional yoga as it has been handed down through the authentic chain of transmission? Do you ever wonder if there is more to Yoga than the aerobic-orientated body culture of today? Do you wish to explore Yoga as a spiritual path or perhaps develop an integrated practice from the outer to inner? Are you ready to go deeper into pranayama, and the subtle energy practices? Are you ready to chant and sing the ancient songs? Do you have deep-seated questions on Yoga? 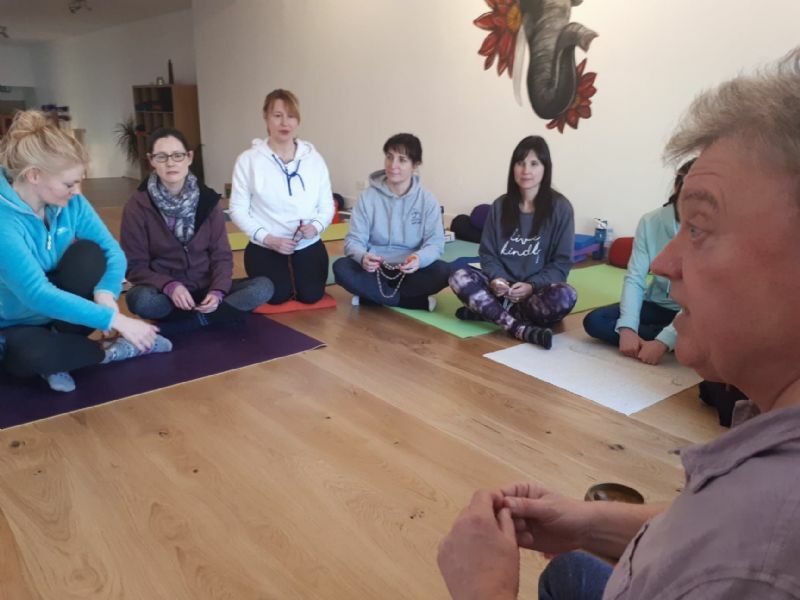 If you`ve answered yes to any of the above questions then you owe it to yourself to embark on this programme that will take you on a wonderful journey through the chakras, to study mantra, to explore the Yoga Sutras, the Upanishads and the Hatha Yoga Pradipika. Michael has studied the ancient science of traditional yoga in the guru parampara tradition, and this is a special opportunity to drink at the well of priceless wisdom. His teaching is underpinned with knowledge, depth and an open and honest desire to share what he knows with generosity. The five satsang workshops are open to serious seekers; all you need is “The Call”- a thirst to learn and an open heart. Although drop-in visitors will be welcome, we would urge prospective students to commit to the five satsangs, as numbers will be limited, so that you get the best out of the teaching and to ensure continuity. THESE SATSANGS ARE FULLY BOOKED. PLEASE E MAIL US IN CASE A PLACE BECOMES AVAILABLE AND YOU WOULD LIKE TO BOOK IT. PLEASE DO NOT ATTEND WITHOUT HAVING BOOKED IN ADVANCE AS THERE IS NO `DROP-IN` AVAILABILITY. DATES: Sunday 5th May & 2nd June.